I recently picked up from Nisbets some Kilner bottles primarily for BBQ sauce and whilst browsing I picked up some clip top preserve jars. It looks like I needed to make something to fill the jars. My first thought was jam. But how to you make small batch jam? What if you only want to fill one jar? After browsing and searching for a while it seemed like the easiest thing to make micro batch jam. Preserving with sugar couldn’t be simpler. The basic formula seems to be 1 part fruit to 1 part sugar. 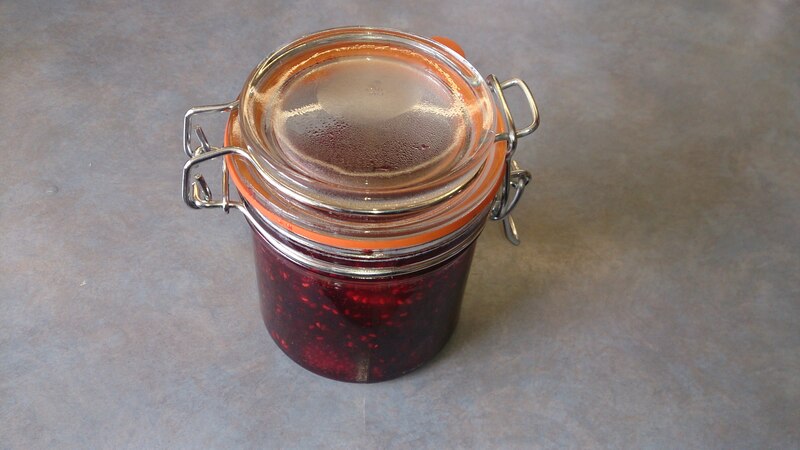 If you use jam sugar it will have pectin already added. The next thing to note is that you don’t need to boil for a long time and not even particularly vigorous. The jam needs to be boiled to 105˚C. Thats about it. Well, another thing to point out is that you don’t need to boil the jars or sterilise them like its the 1950’s. Wash the jars in the dishwasher and pour the boiling jam in. It will do, the jam will only last a week or two at most. This is micro batch jamming, not long term preserving. Add the fruit and sugar to a small heavy bottomed pan. On a medium-high heat, heat up the pan and once it starts bubbling and or spitting, turn down the heat and gently heat to 105˚C. Stirring often. Remove from the heat and stir in the lemon juice. Then pour into a jar. Once cooled pop it in the fridge. Job done. This entry was posted in food, stuff and tagged jam, raspberries. Bookmark the permalink.